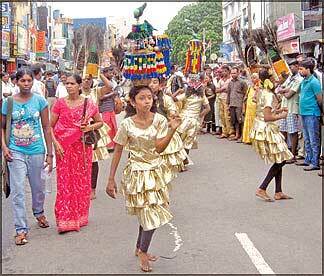 The 136th annual Aadi Vel Festival was held in Colombo on July 23rd 2010 with colour and glamour. Beautifully decorated wooden carved cart left the Colombo Sammānkodu Śrī Kathirvelāyuthaswamy temple in Sea Street left in the morning and reached the Sammānkodu Śrī Mānikka Vinayagar temple at night. The colourful procession paraded through the main streets in Colombo. Traditional musicians playing the Thavil and Nāthaswaram led the procession. The festival wended through many main streets in Colombo after a lapse of 16 years. The colourful procession started from Pettah and travel through York Street, Echelon Square and Galle Road to Bambalapitty, which has been the route for the annual Vel festival for more the 100 years. "There was a Cholera outbreak in Sri Lanka in 1874, and the British rulers did not allow the devotees to attend the annual festival and be on the Pātha Yathra to Kathirgāmam. The devotees in Colombo got together, and celebrated the festival. This led us to celebrate the Vel festival in Colombo annually" says the Chief Trustee of the Colombo Sammankodu Śrī Kathirvelāyuthaswamy temple Mr. A. Manickavasagar. The idols of Lord Murugan and his two wives Goddess Valli Ammai and Goddess Theivayānai paraded in the cart and blessed the devotees on the way. Special Poojas were offered during their comfortable stay at Sammānkodu Śrī Mānikka Vinayagar temple in Bambalapitty. The whole temple was decorated beautifully with Yellow colour lights, Banana leaves and fresh flower ganrlands. Devotees thronged the temple in large numbers to welcome and worship the visiting deities and enjoy the traditional musical concerts. 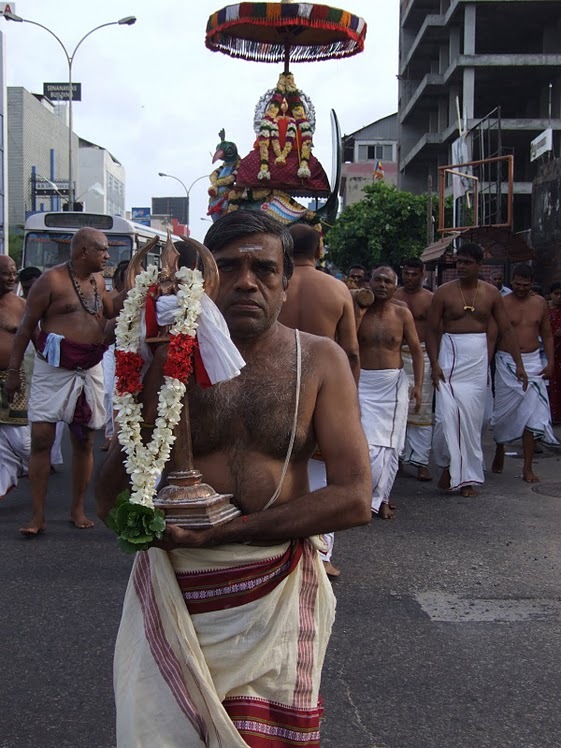 In July (Aadi in Tamil) each year to coincide with the Kathirkamam (Kataragama) festival in honour of Lord Muruga or Skanda , a replica of the Vael (Vel) - a golden spear of the deity - along with the statues of the deity with his consorts Theivānai Amman and Valli Amman are taken in procession in a chariot along the main highway to the Mānicka Vinayagar Temple in Bambalapitiya. The Vale (Vel) Ratham (a silver chariot) carried a golden statue of Lord Muruga and his Vale (Vel) was taken in procession by devotees on foot on Friday from the New Kathiresan Temple at Sea Street in Pettah and reached New Kathiresan Temple in Bambalapitiya. The statue of the deity was kept in the precincts of the latter temple in Bambalapitiya. Yesterday (July 25, 2010), the water-cutting ceremony took place in Kataragama and concurrently the deities statue was taken to the ocean waves near the Bambalapitiya marine drive for similar bathing of the statues. We understand that the two temples mentioned above - Manicka Vinayagar temple and New Kathiresan temple- are managed by two different trustees, but they celebrate this holy festival together. Today (July 26) the Kavadi Ratham will go back to Manicka Vinayagar temple while the Vale (Vel) cart will leave for New Kathiresan temple tomorrow (July 27). The Vale (Vel) Festival like the Kandy Perahera draws thousands of people from different communities. 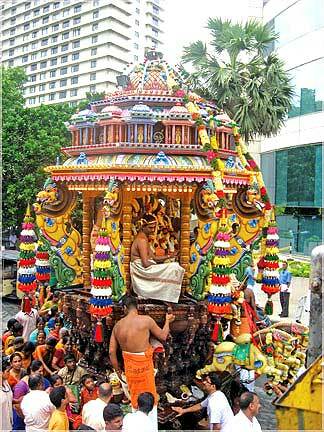 "To mark the occasion, the idols of Lord Murugan, Śrī Valli and Theivānai are driven on a silver plated chariot from the temple of Pettah Kathiresan to Bambalapitiya shrine. "A day or two before the water-cutting festival of Kataragama, a gaily decorated silver plated chariot drawn by a pair of snow-white bulls carrying the statue of Lord Murukan leaves the Pettah Kathiresan temple to the shrine at Bambalapitiya. This is the beginning of the Vel Festival which is held every year to commemorate the victory of Śrī Murukan over the forces of evil. The procession proceeds along the accustomed route with multi-coloured umbrellas, caparisoned elephants, dancers and oriental musicians through a mass of worshippers and sightseers. It moves slowly while the drums throb, the bells tinkle and the Tanjore band plays till it reaches its destination. A bhajana party singing divine songs follows the chariot. After a journey of six miles the pageant enters the temple where thousands of devotees flock to pay their homage to Lord Murakan by breaking coconuts, lighting joss sticks and burning camphor. The temple with its pageantry and panorama of twinkling illuminations attracts the religious and non-believer alike. In the temple precincts and along both sides of the Galle Road traders of all races sell their merchandise - foodstuffs, clothes, brass utensils, camphor, beads, bangles, toys, earthen ware, sweetmeats, pictures, etc. The sugarcane juice dealers also do a brisk business. When the illuminated Vel car returns on the evening of the third or fourth day along the accustomed route the crowd swells to immeasurable proportions. The Galle Road for many miles is a sea of heads, and when the Vel cart arrives at Galle Face Green, the pageant becomes grand and imposing.  The Vale (Vel) was taken in procession by devotees from Colombo to Kataragama on foot (pāda yathra) to bathe in the Manik Ganga more than a century ago. But later (in 1874) the colonial powers did not allow this procession on the grounds that hygienic conditions not conducive prevailed due to an outbreak of cholera in 1874. 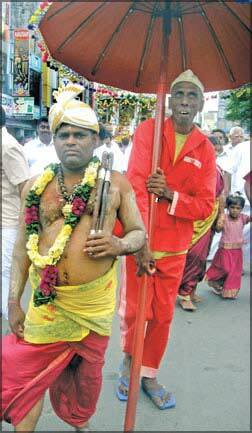 So devotees from all over the island came to Colombo to obtain their blessings. Similar festivals in honour of Lord Muruga take place as a follow up in Keerimalai, Naloor (Nallur) in Yālpānam (Jaffna) and Mandoor and Sithāndy in the East. 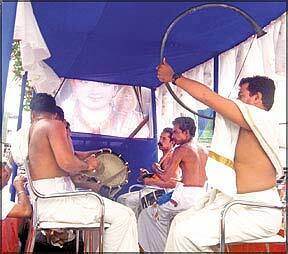 In Colombo too sporadically the festival was held after 1983. The last time the festival was held in Colombo was in 2004. Earlier a public holiday was declared for devotees and visitors to enjoy the festival and receive the grace from Lord Muruga.